Rules must be complied with – and since the Müller-Guttenbrunn Group always strives to work in conformity with the law in all the areas of its’ activities, a new software has been installed to support the MGG employees to this extend. In a company like MGG, texts with legal guidelines, permitting rules and standards stack up. Keeping track of the content of all of these rules and requirements, particularly in following up the deadlines for recurring checks and measurements is not always easy. This is especially the case when laws and regulations change. The companies of the Müller-Guttenbrunn Group are no exception. „We have a huge variety of laws, regulations and standards that we have to adhere to and all these documents fill up countless folders and numerous cupboards. 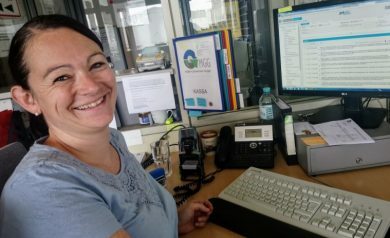 With our new traffic light system, however, we now have everything in view,“ explains Lisa Rainer, specialist in the new compliance software system within the QM department of the Müller-Guttenbrunn Group in Amstetten. She and a whole team around Gunther Panowitz, Günther Höggerl and Paul Lohnecker have introduced the new compliance management software in the company. 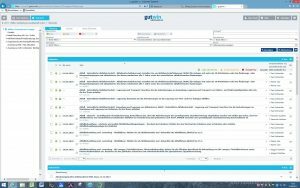 The compliance management software „gutwin“ is supplied by the Vienna based provider Gutwinski Management. The program breaks the complex legal and permitting requirements down into simple and easy-to-understand work instructions and links these instructions together with the deadlines for each of these tasks to the responsible persons. The system sends out e-mails to the responsible persons requesting them to fulfil the corresponding activity within the set-timeframe (for example, to measure whether certain limit values ​​are adhered to). Through their feedback, reports or the like, the system is updated. The already mentioned traffic light system will show the fulfilment rate: green stands for done, yellow for work-in-progress and red for overdue activities. This traffic light system allows the system to create up-to-the-minute reports and relevant documentation for certifications or verifications at the push of a button – which is proving to be very helpful for efficient audits. Before this software system was able to work properly and create reports within seconds however, a lot of preliminary work was necessary. For example some 1,500 legal and permit requirements had to be interpreted properly the MGG companies Metal Recycling Mü-Gu and Metran. In addition, all relevant documents such as permits and authorizations needed to be digitized and this turned out to be not always an easy task, as Lisa Rainer outlined: „The oldest permits documents are from the year 1976, over 40 years ago. No wonder that countless pages were bleached or that the paper threatened to crumble. Of course, these old texts had to be typed into the system manually. “ During the work, the project team also found guidelines and requirements for buildings that ceased to exist since long and the team also found amusing guidelines for the illustrations on WC doors for instance. On the long run, nothing will remain as it is – not even the norms, permits or legal requirements. With „gutwin“ system, however, the database with the legal documentation leading to work instructions can be constantly updated without much effort. Legislation (for instance in the areas of environmental protection, occupational health and safety, plant safety or energy) are entered and automatically adopted by the software manufacturer. After this huge amount of work, we are now absolutely sure: we at Müller-Guttenbrunn comply with the rules! Click here for additional Information about Gutwinski.